Recently Virat Kohli has been in a rich vein of form, scoring 3 one day international centuries in his last four innings and upping his overall average to over 50 with a monumental 183 his most recent effort. He is the quickest to score 10 centuries according to this page (Edit: others have since surpassed this record). The following graphs show the rate at which top ODI century-makers have scored centuries. 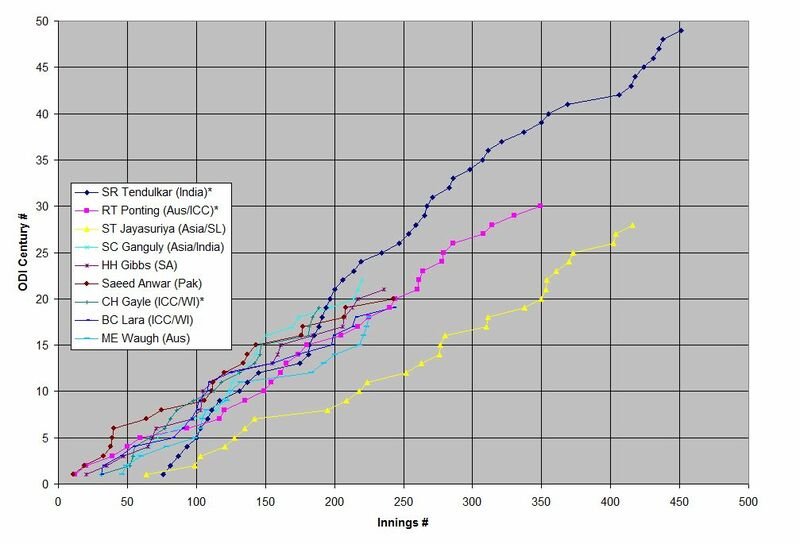 The first shows the top nine century-makers, while the second graph shows nine who have scored 9-13 centuries in not so many innings. A * next to the player’s name indicates a potential for him to add to his tally. We see that current players have a good lead over the rest of the field at this point. One interesting aspect of the above graphs is how many players were fastest to various landmarks of the number of centuries. The following table attempts to capture this (updated March 11 2019). A B de Villiers scored 6 centuries in 13 innings and 10 in 34. He has once scored three in a row and five other times scored two in a row! Warner scored 6 centuries in 11 innings and 7 in 15. Kohli scored 8 centuries in 15 innings, 11 in 26, and 16 in 50! Tendulkar’s stats are amazing. He took 76 innings to score his first century, then had 9 after 117 and entered the above list (before recent updates) during an amazing 12 hundreds in 45 innings period. Since then he only had one gap of more than 16 innings between centuries (37 innings from his 41st to 42nd century). Nobody else (until the mid 2010s) had such consistency of century-scoring over a long period. I have been on google trying every possible keyword to find the fastest to 10…20… centuries. And I found this. This is more than i had imagined for man, I somehow feel this page was dedicated to me, This is amazing work. Thanks a ton. Am curious to know how you managed to extract such data as fastest to 14 ODI innings,etc. I tried playing around with Statsguru but couldn’t find the right filtering. Similarly, it would be cool to see how all the top players fared after 146 games,etc. How to do that? Good question! As far as I know it’s not that straightforward with Statsguru – what I suggest is to write down a list of the suspect players (e.g. Fastest to 5000 ODI runs), then note down the 5 or 6-digit code corresponding to a player by hovering your mouse over the name (e.g. Viv Richards is 52812). Then use Statsguru’s “cumulative average” feature to find how they fared after the relevant number of innings. For example, Richards after 146 innings had 6186 runs @ 49.88 with 11 centuries – http://stats.espncricinfo.com/ci/engine/player/52812.html?class=2;template=results;type=batting;view=cumulative. Simply replace substitute 52812 with other codes to get other players of your choice… I then aggregated the results via a spreadsheet. Hope this helps! Amazing work !!! Can u try to add the innings per century table also .. Thanks, the table has now been updated. It’s Really a great job done. Let me tell you I always refer this page as soon as Amla or Kohli score century and I find updated. really good work. Also I suggest to do the same for test too, if it’s not time consuming. Thanks for the kind words. Good idea about doing the same for tests, I have now created a similar table at https://ckrao.wordpress.com/2014/11/23/fastest-to-n-test-centuries-for-n-sufficiently-large/ . Hashim Amla is on the way to break records after records within showing any attitude. The best part of this person is that he is very simple and has nil attitude, that is why he is favorite to number of Indians too. Thanks for the correction, he’s in the list now. Q De kock is about to bring you more work in updating the table.. second fastest to 9 centuries.. phew !! These table and graph are really good for Cricket fan and interesting to see. I believe, before D Kock, Virat, Villier and Amla started playing their international match, Sachin should be on top (may be sometimes Ganguly/Anwar/Ponting- not sure). Due to T20 match started from 2006, all these 4 top batsman started scoring 100 at a faster rate and frequently and also nowadays, bowlers are not that much good compared to year 1990-2005 (Akram, Waqar, Ambrose, McGrath, Vaas, Pollock, A Donald, S Warne, Murali, S Bond, Brett Lee, S Akhtar). Sachin took 76 innings to score his first hundred against Australia (at the age of 21) otherwise he could be part of the top 3 from 8 to 22 centuries. Reason may be he was so young when he started his career and bated at 4/5/6 position at his initial career (16-20 age). Also have faced all those good bowlers during 1990-2005. He got dismissal 18 times at 90-99 runs. It would be great if he would manage at least 9 centuries from this 18 times (then he would be at 58 ODI centuries). D Kock is just 23+ years and he can go way long along with Kohli for more centuries. May be 5-6 more years for AB and Amla. Lets see if they can surpass Sachin 49 centuries in their career at any number of innings. Please keep updating this whenever these top 4 players score a century. I just found out same link for test as well. Thanks and well done 🙂 cheers !! time to update the list. Amla also took Kohli’s place at 23rd century. Done, thanks for informing me! Time to update. Kohli hits 26th centuty. Hello Good statistics but its more healthy if your stats are start with 1st odi century. Fair enough, I have now taken it back to n=3. I believe 13 players to date have scored centuries in their first ODI innings. You have not update list properly babar Azam took 23 inning to reach 4th odi hundred but as per your stats its shows Finch & Dhawan. can i get n=1 stats please send me link..
Can you please make changes in your existing table where n=1 , n=2 adding the same as sahid afridi name is not there..? secondly its good to see on front page the whole player list. report not yet get updated..? De kock & amla get their hundred today. please update the same..
Awsome Work .. Was looking for the exact info. Thanks a ton. Ganguly earlier had the record of fastest to 16, 17 and 18 ODI centuries. 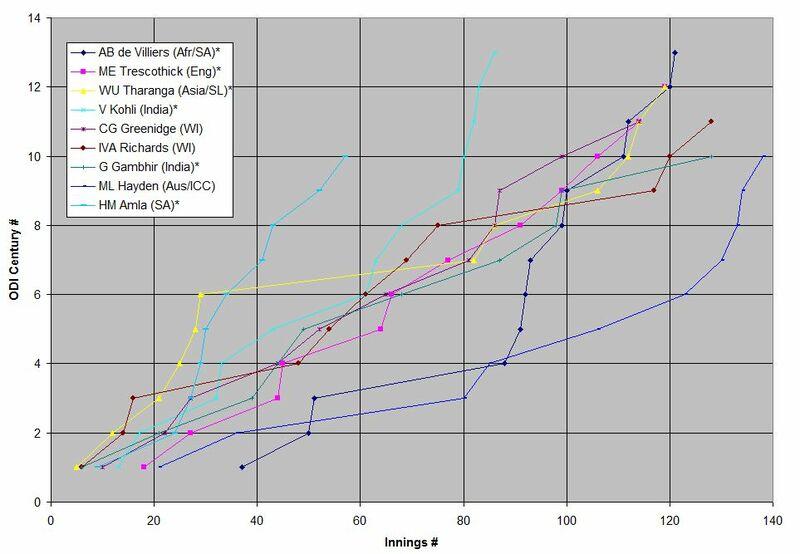 See https://web.archive.org/web/20131016130302/https://ckrao.wordpress.com:80/2012/03/25/fastest-to-n-odi-centuries-for-n-sufficiently-large/ for an earlier version of this post. Babar Azam 6 Centuries in 32 innings. 2nd fastest. Babar Azam 7 centuries in 33 innings. Fastest to 7 centuries. 25. Babar Azam 7th 100 , 33 innings. When can we expect fresh list….????? Thank you, many updates in recent times! Thanks, I have also now updated the figures for Sharma, Dhawan, Taylor and Guptill. Plz imam ul haq. As early as possible. Fastest 3rd and 4th century as I think. Imam Ul Haq had scored his 3rd & 4th century in his 8th & 9th innings respectively then why his name is not included in this list? It is likely to possible Amla will break 8000 fast achieve run, after ward very difficult to manage as Virat made in present time. yo bud, nice work. so much satisfying to read. do you have the same for test matches? Hi buddy. imam hit a 5th century in South Africa… i don’t know in which no of matches, but it must in top 2. b’cuz he only played 20 ODI till now, 27 Jan’19. Imam hit a ton in 3rd ODI and till now 4 odis are played in Pak-SA series. Thanks, he is equal fastest to 5 ODI centures, I have now updated the table.